So who’s holding the hot potato of systemic risk now? Everyone. One of the greatest con jobs of the past 9 years is the status quo’s equivalence of risk and volatility: risk = volatility: so if volatility is low, then risk is low. Wrong: volatility once reflected specific short-term aspects of risk, but measures of volatility such as the VIX have been hijacked to generate the illusion that risk is low. But even an unmanipulated VIX doesn’t reflect the true measure of systemic risk, a topic Gordon Long and I discuss in our latest program, The Game of Risk Transfer. The financial industry has reaped enormous “guaranteed” gains by betting against volatility. As volatility steadily declined over the past two years, billions of dollars were reaped by constantly betting that volatility would continue declining. Other “guaranteed” trades have been corporate buybacks funded by cheap credit and passive index funds Central bank policies–near-zero interest rates and “we’ve got your back” asset purchases that made buying every dip a no-brainer trading strategy–have changed as banks attempt to dial back their stimulus and near-zero rates, and as a result volatility cannot continue declining in a nice straight line heading toward zero. 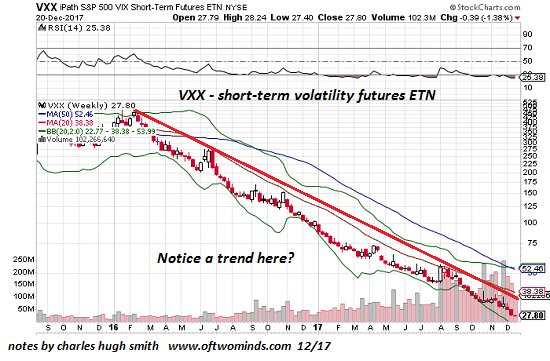 Now that central banks have to change course, certainty has morphed into uncertainty, and risk is rising, regardless of what the VIX index does on a daily basis. Here is what a “guaranteed gains by buying the dip” market looks like: just bet that central banks will buy every dip and suppress volatility, and you’re a genius. Previous article by Charles Hugh Smith: Russian Meddling?